On December 23, 2003, targeted surveillance identified a “downer” dairy cow (ie, nonambulatory and disabled) that tested positive for BSE. This was confirmed by the BSE International Reference Laboratory in Weybridge, England, on December 25. On December 9, 2003, the downer dairy cow had been slaughtered in the state of Washington. Because the animal's condition was attributed to complications from calving, the meat was considered safe for human consumption by the US Department of Agriculture (USDA). Tissues such as brain, spinal cord, and small intestine, which may have a higher likelihood of containing the pathogenic agent of BSE, were removed during slaughter and sent for rendering (often to be used as nonruminant animal feed). On January 26, 2004, the US Food and Drug Administration (FDA) announced new rules to further strengthen existing protection against BSE, including banning a wide range of bovine material from human food (United States Department of Health and Human Services, Expanded "Mad Cow" Safeguards Announced To Strengthen Existing Firewalls Against BSE Transmission). On February 9, 2004, the USDA completed its investigations. Although this was the first case of BSE in the United States, more than 190,000 confirmed clinical cases have been reported worldwide since 1986, and approximately 184,000 cases were from the United Kingdom alone (see the images below). Additional information is available at OIE, Bovine Spongiform Encephalopathy (BSE). Based on mathematical modeling of the BSE epidemic, estimates suggest that 1-3 million cattle may have been infected with the BSE agent in the United Kingdom. [10, 11] Most of these infected animals were slaughtered for human consumption before any clinical signs of BSE were noted. Incidence of bovine spongiform encephalopathy (BSE) and variant Creutzfeldt-Jakob disease (CJD) in Great Britain. 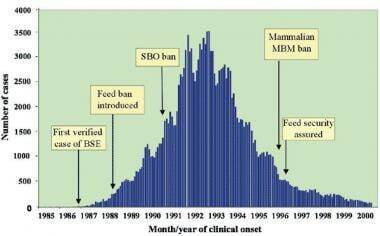 The BSE epidemic peaked in 1992, 4 years after the introduction of the ban on ruminant feed. The associated human disease, variant CJD, was not defined until 1996, 7 years after a ban was introduced in Britain on the use of specified offal from cattle in human food. 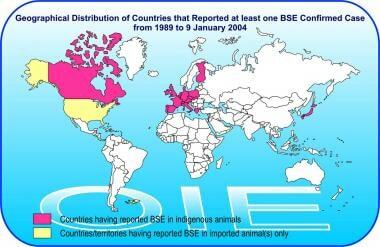 Geographic distribution of bovine spongiform encephalopathy (BSE) by country as of January 9, 2004. From http://www.oie.int/eng/info/en_esb.htm. Further cases of BSE were reported in imported cattle in the Falkland Islands (imported from the United Kingdom) and Oman (imported from the United Kingdom). No documented cases have been reported from Africa, Australia, New Zealand, or South America. No treatment is available for BSE; the disease is relentlessly progressive until the animal dies or is destroyed. This usually occurs in 2 weeks to 6 months. An alternative hypothesis was proposed in the controversial final BSE inquiry report in the United Kingdom that was released October 24, 2000, suggesting that a pathogenic mutation occurred in cattle in the 1970s, with BSE occurring as a consequence of recycling of infected cattle. The report asserts that BSE cases identified from 1986-1988 were not index cases, nor were they the result of the transmission of scrapie. Recognition of the source of infection led to several countermeasures to break the cycle of cattle reinfection, restrict the geographic spread, and eliminate the potential source of new infection. The most important step was banning ruminant feed in 1988, extending it to include the feeding of specified bovine offal. By 1992, this ban started to bring the epidemic under control. See the image below. Time course of epidemic bovine spongiform encephalopathy (BSE) in the United Kingdom, 1986-2000, with dates of major precautionary interventions. SBO stands for specified bovine offal (ie, brain, spinal cord, thymus, spleen, and intestines from cattle aged >6 mo). MBM stands for meat and bone meal (protein residue produced by rendering). From Brown P, Will RG, Bradley R, et al. "Bovine spongiform encephalopathy and variant Creutzfeldt-Jakob disease: background, evolution and current concerns". Emerging Infectious Diseases, 2001;7: 6-16. The risk factors for the development of variant CJD include younger age (as compared with classic CJD), residence in the United Kingdom, and methionine homozygosity at codon 129 of the prion protein gene (PRNP). [33, 34] The encoding alternatives, methionine (Met) and valine (Val), are distributed in white populations in the approximate proportions of 50% Met/Val, 40% Met/Met, and 10% Val/Val. All patients with variant CJD who have been tested have been homozygous for methionine. A reduced frequency of HLA class II type DQ7 has been described in patients with variant CJD but not in those with classic CJD; this may have important implications for understanding host susceptibility to infection by BSE prions. Past surgery, previous blood transfusion, and occupation have not been shown to be associated with increased risk, although 2 cases have been reported in patients who received blood transfusions from donors who then went on to develop variant CJD. BSE and variant CJD are similar on the basis of patterns of infectable mouse strains, incubation time, survival time, lesion distribution in the mouse brain, PrPSc gel banding patterns, and neuropathology, which are readily distinguishable from other TSEs, such as scrapie and sporadic CJD. [42, 43, 44, 45, 46] Pathological investigation shows characteristic spongiform change and gliosis in the brain. These changes are most predominant in basal ganglia and cerebellum. Because no occupational exposure of patients with variant CJD to cattle on farms or in abattoirs has been identified, spread is likely to occur through consumption of BSE-contaminated meat products. Whether PrPSc (prion protein, scrapie isoform) can be demonstrated in skeletal muscles remains controversial. [47, 48, 49, 50] However, a high-sensitivity Western blotting technique identified muscle PrPSc in 8 of the 17 patients studied, although in much lower concentrations than in the cerebral cortex, suggesting a potential role for skeletal muscle in the transmission of variant CJD. Despite this evidence, the infection probably resulted from beef products contaminated by nervous tissue, because neural tissues have a much higher concentration of PrPSc than other peripheral tissues. Concern is widespread that the blood supply might be contaminated with the variant CJD agent. This possibility is supported by evidence that BSE in sheep can be transmitted by blood transfusion. This concern progressed to fear with a report of a patient who died of variant CJD 6.5 years after receiving a transfusion of red blood cells donated by an individual who subsequently developed variant CJD. The authors do not present direct evidence that the disease was transmitted by blood transfusion, but the chance that this case is not transfusion related is very small. One more case of blood transfusion–related variant CJD has been reported. This case is unique and very important in terms of its implications. This patient died from a non-neurologic disorder 5 years after receiving a blood transfusion from a donor who subsequently developed variant CJD, and he had no symptoms suggestive of variant CJD at the time of his death. Protease-resistant prion protein (PrPres) was detected in the spleen and a cervical lymph node but not in the brain. He was heterozygote at codon 129 of PRNP, suggesting that susceptibility to variant CJD infection is not confined to methionine homozygous PRNP genotype. In the late 1990s, the United Kingdom implemented strategies for risk reduction. These included importation of plasma from the United States for preparation of plasma derivatives (i.e., clotting factors), disposal of certain surgical instruments, and universal leukoreduction in transfusions. There have been a total of four affected individuals from the United Kingdom who received non-leucoreduced red cell concentrates from UK donors. This possibility, combined with the probable existence of subclinical carriers, raises the specter of an iatrogenic human-to-human wave of variant CJD transmission. This again highlights the need for reliable detection methods for prion-tainted blood products. In addition, a finding of preclinical infection in a patient heterozygous at codon 129 of PRNP has significant implications regarding the future estimates and surveillance of variant CJD. According to the World Health Organization fact sheet on variant CJD (revised February 2012), 224 total cases of variant CJD were reported worldwide through March 2011: 175 cases in the United Kingdom and 49 cases in other countries (25 in France, 5 in Spain, 4 in Ireland, 3 in the Netherlands, 3 in the United States, 2 in Canada, 2 in Italy, 2 in Portugal, 1 in Japan, 1 in Saudi Arabia, and 1 in Taiwan). [63, 64, 7] . According to the National CJD Research and Surveillance Unit in Edinburgh, UK (2015), there have been a total of 229 cases of variant CJD reported worldwide and no new-onset cases since 2012. The number of cases of variant CJD peaked in 2000 in the United Kingdom at 28 and then steadied at 20 cases in 2001, 17 in 2002, and 18 in 2003. Nine new cases were reported in 2004 and another 5 in 2005. The rate has since declined to about 2 cases per year, through 2008. This raises the possibility that the epidemic may have peaked. Despite the optimism, uncertainty remains about the likely size of the total variant CJD epidemic, because such calculations depend on assumptions, including the mean incubation period in humans or the infectious dose of BSE for humans. In contrast, sporadic CJD occurs with a uniform incidence of 1 case per million population per year worldwide. Other forms of prion diseases are even rarer. Autopsies are performed in only an estimated 22% of cases of CJD in California. The autopsy rates of suspected cases of CJD should be increased because only a pathologic review of tissue can distinguish between classic and variant forms of CJD. Like other prion-related diseases, variant CJD is relentlessly progressive and inevitably leads to death. Sikorska B, Knight R, Ironside JW, Liberski PP. Creutzfeldt-Jakob disease. Adv Exp Med Biol. 2012. 724:76-90. [Medline]. APHIS. Bovine Spongiform Encephalopathy (BSE). Available at: http://www.aphis.usda.gov/. Available at http://www.aphis.usda.gov/lpa/issues/bse/bse.html. Bovine Spongiform Encephalopathy (BSE) Inquiry. The BSE Inquiry. Available at http://www.bseinquiry.gov.uk/. Centers for Disease Control and Prevention. Fact Sheet: New Variant Creutzfeldt-Jakob Disease. Centers for Disease Control and Prevention. Available at http://www.cdc.gov/. Department for Environment Food and Rural Affairs. BSE: Other TSEs - Creutzfeldt-Jakob Disease (CJD). Department for Environment, Food, and Rural Affairs UK. Available at http://www.defra.gov.uk/animalh/bse/othertses/cjd.html. Accessed: July 12, 2004. Centers for Disease Control and Prevention. Department of Health and Human Services. vCJD (Variant Creutzfeldt-Jakob Disease). Available at http://www.cdc.gov/ncidod/dvrd/vcjd/factsheet_nvcjd.htm. Accessed: May 29, 2012. World Health Organization. Variant Creutzfeldt-Jakob Disease. Media Centre. Available at http://www.who.int/mediacentre/factsheets/fs180/en/. Accessed: May 29, 2012. Geschwind MD. Prion Diseases. Continuum (Minneap Minn). 2015 Dec. 21 (6 Neuroinfectious Disease):1612-38. [Medline]. United States Department of Agriculture. Veneman Announces Additional Protection Measures To Guard Against BSE. Available at http://www.usda.gov/. Accessed: December 30, 2003. Anderson RM, Donnelly CA, Ferguson NM, Woolhouse ME, Watt CJ, Udy HJ, et al. Transmission dynamics and epidemiology of BSE in British cattle. Nature. 1996 Aug 29. 382(6594):779-88. [Medline]. Donnelly CA, Ferguson NM, Ghani AC, Anderson RM. Implications of BSE infection screening data for the scale of the British BSE epidemic and current European infection levels. Proc R Soc Lond B Biol Sci. 2002 Nov 7. 269(1506):2179-90. [Medline]. Alabama BSE Investigation. Final Epidemiology Report (USDA, APHIS). Available at http://www.aphis.usda.gov/newsroom/hot_issues/bse/downloads/EPIFinal5-2-06.pdf. BBC News. Mad cow' disease found in California dairy cow. BBC News - US and Canada. Available at http://www.bbc.co.uk/news/world-us-canada-17834299. Accessed: April 26, 2012. Brown P, Will RG, Bradley R, Asher DM, Detwiler L. Bovine spongiform encephalopathy and variant Creutzfeldt-Jakob disease: background, evolution, and current concerns. Emerg Infect Dis. 2001 Jan-Feb. 7(1):6-16. [Medline]. Wells GA, Scott AC, Wilesmith JW, Simmons MM, Matthews D. Correlation between the results of a histopathological examination and the detection of abnormal brain fibrils in the diagnosis of bovine spongiform encephalopathy. Res Vet Sci. 1994 May. 56(3):346-51. [Medline]. Wells GA, Hancock RD, Cooley WA, Richards MS, Higgins RJ, David GP. Bovine spongiform encephalopathy: diagnostic significance of vacuolar changes in selected nuclei of the medulla oblongata. Vet Rec. 1989 Nov 18. 125(21):521-4. [Medline]. Brown P, Bradley R. 1755 and all that: a historical primer of transmissible spongiform encephalopathy. BMJ. 1998 Dec 19-26. 317(7174):1688-92. [Medline]. Smith PG, Cousens SN. Is the new variant of Creutzfeldt-Jakob disease from mad cows?. Science. 1996 Aug 9. 273(5276):748. [Medline]. Brown P. The risk of bovine spongiform encephalopathy ('mad cow disease') to human health. JAMA. 1997 Sep 24. 278(12):1008-11. [Medline]. Collee JG, Bradley R. BSE: a decade on--Part I. Lancet. 1997 Mar 1. 349(9052):636-41. [Medline]. Collee JG, Bradley R. Bovine Spongiform Encephalopathy (BSE): a decade on--Part 2. Lancet. 1997 Mar 8. 349(9053):715-21. [Medline]. Schreuder BE. Animal spongiform encephalopathies--an update. Part 1. Scrapie and lesser known animal spongiform encephalopathies. Vet Q. 1994 Oct. 16(3):174-81. [Medline]. Nathonson N, Wilesmith J, Wells GA. Bovine spongiform encephalopathy and related disorders. Pruisner SB, ed. Prion Biology and Diseases. Cold Springs Harbor, NY: Cold Springs Harbor Laboratory Press; 1999. Sigurdson CJ, Miller MW. Other animal prion diseases. Br Med Bull. 2003. 66:199-212. [Medline]. Bradley R. Animal prion diseases. Collinge J, Palmer MS. Prion Diseases. Oxford, England: Oxford University Press; 1997. 91-127. Commission of European Communities. Commission Decision. 27 December 2000 amending Decision 2000/418/EC regulating the use of material presenting risks as regards transmissible spongiform encephalopathies. Official Journal of the European Communities. Available at http://europa.eu.int/comm/food/fs/bse/bse23_en.pdf. Holt TA, Phillips J. Bovine spongiform encephalopathy. Br Med J (Clin Res Ed). 1988 Jun 4. 296(6636):1581-2. [Medline]. Taylor DM. Bovine spongiform encephalopathy and human health. Vet Rec. 1989 Oct 14. 125(16):413-5. [Medline]. Dealer SF, Lacey RW. Transmissible spongiform encephalopathies: the threat of BSE to man. Vol 7. Food Microbiology. 1990:253-79. Bateman D, Hilton D, Love S, Zeidler M, Beck J, Collinge J. Sporadic Creutzfeldt-Jakob disease in a 18-year-old in the UK. Lancet. 1995 Oct 28. 346(8983):1155-6. [Medline]. Britton TC, al-Sarraj S, Shaw C, Campbell T, Collinge J. Sporadic Creutzfeldt-Jakob disease in a 16-year-old in the UK. Lancet. 1995 Oct 28. 346(8983):1155. [Medline]. Will RG, Ironside JW, Zeidler M, Cousens SN, Estibeiro K, Alperovitch A, et al. A new variant of Creutzfeldt-Jakob disease in the UK. Lancet. 1996 Apr 6. 347(9006):921-5. [Medline]. California Emerging Infections Program. California Creutzfeldt-Jakob Disease (CJD) Surveillance Project. California Emerging Infections Program. Available at http://www.ceip.us/cjd.htm. Bishop MT, Pennington C, Heath CA, Will RG, Knight RS. PRNP variation in UK sporadic and variant Creutzfeldt Jakob disease highlights genetic risk factors and a novel non-synonymous polymorphism. BMC Med Genet. 2009 Dec 26. 10:146. [Medline]. [Full Text]. Will RG. Acquired prion disease: iatrogenic CJD, variant CJD, kuru. Br Med Bull. 2003. 66:255-65. [Medline]. Jackson GS, Beck JA, Navarrete C, Brown J, Sutton PM, Contreras M, et al. HLA-DQ7 antigen and resistance to variant CJD. Nature. 2001 Nov 15. 414(6861):269-70. [Medline]. Bishop MT, Hart P, Aitchison L, Baybutt HN, Plinston C, Thomson V, et al. Predicting susceptibility and incubation time of human-to-human transmission of vCJD. Lancet Neurol. 2006 May. 5(5):393-8. [Medline]. Beisel CE, Morens DM. Variant Creutzfeldt-Jakob disease and the acquired and transmissible spongiform encephalopathies. Clin Infect Dis. 2004 Mar 1. 38(5):697-704. [Medline]. Bradley R, Collee JG, Liberski PP. Variant CJD (vCJD) and bovine spongiform encephalopathy (BSE): 10 and 20 years on: part 1. Folia Neuropathol. 2006. 44(2):93-101. [Medline]. Collee JG, Bradley R, Liberski PP. Variant CJD (vCJD) and bovine spongiform encephalopathy (BSE): 10 and 20 years on: part 2. Folia Neuropathol. 2006. 44(2):102-10. [Medline]. Foster JD, Hope J, Fraser H. Transmission of bovine spongiform encephalopathy to sheep and goats. Vet Rec. 1993 Oct 2. 133(14):339-41. [Medline]. Collinge J, Sidle KC, Meads J, Ironside J, Hill AF. Molecular analysis of prion strain variation and the aetiology of 'new variant' CJD. Nature. 1996 Oct 24. 383(6602):685-90. [Medline]. Lasmezas CI, Deslys JP, Demaimay R, Prusiner SB. BSE transmission to macaques. Nature. 1996 Jun 27. 381(6585):743-4. [Medline]. Bruce ME, Will RG, Ironside JW, McConnell I, Drummond D, Suttie A, et al. Transmissions to mice indicate that 'new variant' CJD is caused by the BSE agent. Nature. 1997 Oct 2. 389(6650):498-501. [Medline]. Hill AF, Desbruslais M, Joiner S, Sidle KC, Gowland I, Collinge J, et al. The same prion strain causes vCJD and BSE. Nature. 1997 Oct 2. 389(6650):448-50, 526. [Medline]. Lasmézas CI, Fournier JG, Nouvel V, Boe H, Marcé D, Lamoury F, et al. Adaptation of the bovine spongiform encephalopathy agent to primates and comparison with Creutzfeldt-- Jakob disease: implications for human health. Proc Natl Acad Sci U S A. 2001 Mar 27. 98(7):4142-7. [Medline]. Wadsworth JD, Joiner S, Hill AF, Campbell TA, Desbruslais M, Luthert PJ, et al. Tissue distribution of protease resistant prion protein in variant Creutzfeldt-Jakob disease using a highly sensitive immunoblotting assay. Lancet. 2001 Jul 21. 358(9277):171-80. [Medline]. Bosque PJ, Ryou C, Telling G, Peretz D, Legname G, DeArmond SJ, et al. Prions in skeletal muscle. Proc Natl Acad Sci U S A. 2002 Mar 19. 99(6):3812-7. [Medline]. Glatzel M, Abela E, Maissen M, Aguzzi A. Extraneural pathologic prion protein in sporadic Creutzfeldt-Jakob disease. N Engl J Med. 2003 Nov 6. 349(19):1812-20. [Medline]. Head MW, Ritchie D, Smith N, McLoughlin V, Nailon W, Samad S, et al. Peripheral tissue involvement in sporadic, iatrogenic, and variant Creutzfeldt-Jakob disease: an immunohistochemical, quantitative, and biochemical study. Am J Pathol. 2004 Jan. 164(1):143-53. [Medline]. Peden AH, Ritchie DL, Head MW, Ironside JW. Detection and localization of PrPSc in the skeletal muscle of patients with variant, iatrogenic, and sporadic forms of Creutzfeldt-Jakob disease. Am J Pathol. 2006 Mar. 168(3):927-35. [Medline]. Blättler T. Transmission of prion disease. APMIS. 2002 Jan. 110(1):71-8. [Medline]. O'Rourke KI, Huff TP, Leathers CW, Robinson MM, Gorham JR. SCID mouse spleen does not support scrapie agent replication. J Gen Virol. 1994 Jun. 75 ( Pt 6):1511-4. [Medline]. Beekes M, McBride PA, Baldauf E. Cerebral targeting indicates vagal spread of infection in hamsters fed with scrapie. J Gen Virol. 79 (Pt 3):601-7. [Medline]. McBride PA, Beekes M. Pathological PrP is abundant in sympathetic and sensory ganglia of hamsters fed with scrapie. Neurosci Lett. 1999 Apr 16. 265(2):135-8. [Medline]. Houston F, Foster JD, Chong A, Hunter N, Bostock CJ. Transmission of BSE by blood transfusion in sheep. Lancet. 2000 Sep 16. 356(9234):999-1000. [Medline]. Notari S, Moleres FJ, Hunter SB, Belay ED, Schonberger LB, Cali I, et al. Multiorgan detection and characterization of protease-resistant prion protein in a case of variant CJD examined in the United States. PLoS One. 2010 Jan 19. 5(1):e8765. [Medline]. [Full Text]. Llewelyn CA, Hewitt PE, Knight RS, Amar K, Cousens S, Mackenzie J, et al. Possible transmission of variant Creutzfeldt-Jakob disease by blood transfusion. Lancet. 2004 Feb 7. 363(9407):417-21. [Medline]. Peden AH, Head MW, Ritchie DL, Bell JE, Ironside JW. Preclinical vCJD after blood transfusion in a PRNP codon 129 heterozygous patient. Lancet. 2004 Aug 7-13. 364(9433):527-9. [Medline]. Collins SJ, Lawson VA, Masters CL. Transmissible spongiform encephalopathies. Lancet. 2004 Jan 3. 363(9402):51-61. [Medline]. Aguzzi A, Polymenidou M. Mammalian prion biology: one century of evolving concepts. Cell. 2004 Jan 23. 116(2):313-27. [Medline]. Gill ON, Spencer Y, Richard-Loendt A, Kelly C, Dabaghian R, Boyes L. Prevalent abnormal prion protein in human appendixes after bovine spongiform encephalopathy epizootic: large scale survey. BMJ. 2013. 347:f5675. [Medline]. World Health Organization. The revision of the surveillance case definition for variant Creutzfeldt-Jakob Disease (vCJD). Report of a WHO consultation Edinburgh, United Kingdom 17 May 2001. World Health Organization. Available at http://www.who.int/csr/resources/publications/bse/WHO_CDS_CSR_EPH_2001_5/en/. World Health Organization. WHO Infection Control Guidelines for Transmissible Spongiform Encephalopathies. Report of a WHO Consultation, Geneva, Switzerland, 23-26 March 1999. World Health Organization. Available at http://www.who.int/csr/resources/publications/bse/WHO_CDS_CSR_APH_2000_3/en/. UK Health Protection Agency. Health protection agency press release: new case of variant CJD associated with blood transfusion. Available at http://www.hpa.org.uk/hpa/news/articles/press_releases/2006/060209_cjd.htm. Andrews NJ, Farrington CP, Ward HJ, Cousens SN, Smith PG, Molesworth AM, et al. 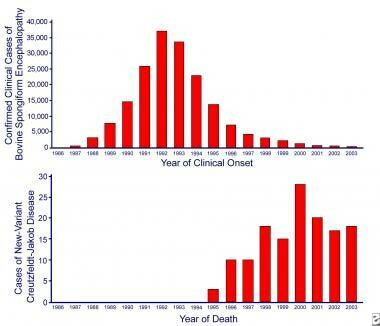 Deaths from variant Creutzfeldt-Jakob disease in the UK. Lancet. 2003 Mar 1. 361(9359):751-2. [Medline]. Holman RC, Belay ED, Christensen KY, Maddox RA, Minino AM, Folkema AM, et al. Human prion diseases in the United States. PLoS One. 2010 Jan 1. 5(1):e8521. [Medline]. [Full Text]. Cousens SN, Vynnycky E, Zeidler M, Will RG, Smith PG. Predicting the CJD epidemic in humans. Nature. 1997 Jan 16. 385(6613):197-8. [Medline]. Ghani AC, Ferguson NM, Donnelly CA, Anderson RM. Predicted vCJD mortality in Great Britain. Nature. 2000 Aug 10. 406(6796):583-4. [Medline]. d'Aignaux JN, Cousens SN, Smith PG. Predictability of the UK variant Creutzfeldt-Jakob disease epidemic. Science. 2001 Nov 23. 294(5547):1729-31. [Medline]. Valleron AJ, Boelle PY, Will R, Cesbron JY. Estimation of epidemic size and incubation time based on age characteristics of vCJD in the United Kingdom. Science. 2001 Nov 23. 294(5547):1726-8. [Medline]. Clewley JP, Kelly CM, Andrews N, Vogliqi K, Mallinson G, Kaisar M. Prevalence of disease related prion protein in anonymous tonsil specimens in Britain: cross sectional opportunistic survey. BMJ. 2009. 338:b1442. [Medline]. US National Prion Disease Pathology Surveillance Center. The National Creutzfeldt-Jakob Disease Surveillance Unit. US National Prion Disease Pathology Surveillance Center. Available at http://www.cjdsurveillance.com/. Accessed: June 6, 2005. Lorains JW, Henry C, Agbamu DA, Rossi M, Bishop M, Will RG, et al. Variant Creutzfeldt-Jakob disease in an elderly patient. Lancet. 2001 Apr 28. 357(9265):1339-40. [Medline]. Cooper JD, Bird SM. Predicting incidence of variant Creutzfeldt-Jakob disease from UK dietary exposure to bovine spongiform encephalopathy for the 1940 to 1969 and post-1969 birth cohorts. Int J Epidemiol. 2003 Oct. 32(5):784-91. [Medline]. Huillard d'Aignaux JN, Cousens SN, Maccario J, Costagliola D, Alpers MP, Smith PG, et al. The incubation period of kuru. Epidemiology. 2002 Jul. 13(4):402-8. [Medline]. Swerdlow AJ, Higgins CD, Adlard P, Jones ME, Preece MA. Creutzfeldt-Jakob disease in United Kingdom patients treated with human pituitary growth hormone. Neurology. 2003 Sep 23. 61(6):783-91. [Medline]. Croes EA, Roks G, Jansen GH, Nijssen PC, van Duijn CM. Creutzfeldt-Jakob disease 38 years after diagnostic use of human growth hormone. J Neurol Neurosurg Psychiatry. 2002 Jun. 72(6):792-3. [Medline]. Aguzzi A, Glatzel M. Prion infections, blood and transfusions. Nat Clin Pract Neurol. 2006 Jun. 2(6):321-9. [Medline]. Hewitt PE, Llewelyn CA, Mackenzie J, Will RG. Creutzfeldt-Jakob disease and blood transfusion: results of the UK Transfusion Medicine Epidemiological Review study. Vox Sang. 2006 Oct. 91(3):221-30. [Medline]. Spencer MD, Knight RS, Will RG. First hundred cases of variant Creutzfeldt-Jakob disease: retrospective case note review of early psychiatric and neurological features. BMJ. 2002 Jun 22. 324(7352):1479-82. [Medline]. Zeidler M, Stewart GE, Barraclough CR, Bateman DE, Bates D, Burn DJ, et al. New variant Creutzfeldt-Jakob disease: neurological features and diagnostic tests. Lancet. 1997 Sep 27. 350(9082):903-7. [Medline]. Zeidler M, Johnstone EC, Bamber RW, Dickens CM, Fisher CJ, Francis AF, et al. New variant Creutzfeldt-Jakob disease: psychiatric features. Lancet. 1997 Sep 27. 350(9082):908-10. [Medline]. Allroggen H, Dennis G, Abbott RJ, Pye IF. New variant Creutzfeldt-Jakob disease: three case reports from Leicestershire. J Neurol Neurosurg Psychiatry. 2000 Mar. 68(3):375-8. [Medline]. Dervaux A, Vicart S, Lopes F, Le Borgne MH. Psychiatric features of vCJD similar in France and UK. Br J Psychiatry. 2001 Mar. 178:276. [Medline]. Will RG, Stewart G, Zeidler M. Psychiatric features of new variant Creutzfeldt-Jakob disease. Psychiatric Bull. 1999. 23:264-7. UK National Creutzfeldt-Jakob Disease Surveillance Unit. National Creutzfeldt-Jakob Disease Surveillance Unit. University of Edinburgh. Available at http://www.cjd.ed.ac.uk. Accessed: July 19, 2005. Race R, Chesebro B. Scrapie infectivity found in resistant species. Nature. 1998 Apr 23. 392(6678):770. [Medline]. Race R, Raines A, Raymond GJ, Caughey B, Chesebro B. Long-term subclinical carrier state precedes scrapie replication and adaptation in a resistant species: analogies to bovine spongiform encephalopathy and variant Creutzfeldt-Jakob disease in humans. J Virol. 2001 Nov. 75(21):10106-12. [Medline]. Hill AF, Joiner S, Linehan J, Desbruslais M, Lantos PL, Collinge J. Species-barrier-independent prion replication in apparently resistant species. Proc Natl Acad Sci U S A. 2000 Aug 29. 97(18):10248-53. [Medline]. Taylor D. Inactivation of the BSE agent. C R Acad Sci III. 2002 Jan. 325(1):75-6. [Medline]. Jackson, G et al. Population Screening for Variant Creutzfeldt-Jakob Disease Using a Novel Blood Test. JAMA Neurology. April 2014. 71 (4):421-428. Green AJ, Thompson EJ, Stewart GE, Zeidler M, McKenzie JM, MacLeod MA, et al. Use of 14-3-3 and other brain-specific proteins in CSF in the diagnosis of variant Creutzfeldt-Jakob disease. J Neurol Neurosurg Psychiatry. 2001 Jun. 70(6):744-8. [Medline]. Steinacker P, Rist W, Swiatek-de-Lange M, Lehnert S, Jesse S, Pabst A, et al. Ubiquitin as potential cerebrospinal fluid marker of Creutzfeldt-Jakob disease. Proteomics. 2010 Jan. 10(1):81-9. [Medline]. Lekishvili T, Sassoon J, Thompsett AR, Green A, Ironside JW, Brown DR. BSE and vCJD cause disturbance to uric acid levels. Exp Neurol. 2004 Nov. 190(1):233-44. [Medline]. Haïk S, Brandel JP, Oppenheim C, Sazdovitch V, Dormont D, Hauw JJ, et al. Sporadic CJD clinically mimicking variant CJD with bilateral increased signal in the pulvinar. Neurology. 2002 Jan 8. 58(1):148-9. [Medline]. Kim MO, Geschwind MD. Clinical update of Jakob-Creutzfeldt disease. Curr Opin Neurol. 2015. 28 (3):302-310. Hill AF, Zeidler M, Ironside J, Collinge J. Diagnosis of new variant Creutzfeldt-Jakob disease by tonsil biopsy. Lancet. 1997 Jan 11. 349(9045):99-100. [Medline]. Hilton DA, Sutak J, Smith ME, Penney M, Conyers L, Edwards P, et al. Specificity of lymphoreticular accumulation of prion protein for variant Creutzfeldt-Jakob disease. J Clin Pathol. 2004 Mar. 57(3):300-2. [Medline]. Collinge J. Variant Creutzfeldt-Jakob disease. Lancet. 1999 Jul 24. 354(9175):317-23. [Medline]. Ironside JW, Hilton DA, Ghani A, Johnston NJ, Conyers L, McCardle LM, et al. Retrospective study of prion-protein accumulation in tonsil and appendix tissues. Lancet. 2000 May 13. 355(9216):1693-4. [Medline]. Hilton DA, Ghani AC, Conyers L, Edwards P, McCardle L, Penney M, et al. Accumulation of prion protein in tonsil and appendix: review of tissue samples. BMJ. 2002 Sep 21. 325(7365):633-4. [Medline]. Frosh A, Smith LC, Jackson CJ, Linehan JM, Brandner S, Wadsworth JD, et al. Analysis of 2000 consecutive UK tonsillectomy specimens for disease-related prion protein. Lancet. 2004 Oct 2-8. 364(9441):1260-2. [Medline]. Salmon R. How widespread is variant Creutzfeldt-Jakob disease?. BMJ. 2013. 347:f5994. de Marco MF, Linehan J, Gill ON, et al. Large-scale immunohistochemical examination for lymphoreticular prion protein in tonsil specimens collected in Britain. J Pathol. 2010. 222 (4):380-387. Clewley JP, Kelly CM, Andrews N, et al. Prevalence of disease related prion protein in anonymous tonsil specimens in Britain: cross sectional opportunistic survey. BMJ. 2009. 338:b1442. Heath CA, Cooper SA, Murray K, et al. Validation of diagnostic criteria for variant Creutzfeldt-Jakob disease. Ann Neurol. 2010. 67 (6):761-770. Ironside JW, McCardle L, Horsburgh A, Lim Z, Head MW. Pathological diagnosis of variant Creutzfeldt-Jakob disease. APMIS. 2002 Jan. 110(1):79-87. [Medline]. Parchi P, Giese A, Capellari S, Brown P, Schulz-Schaeffer W, Windl O, et al. Classification of sporadic Creutzfeldt-Jakob disease based on molecular and phenotypic analysis of 300 subjects. Ann Neurol. 1999 Aug. 46(2):224-33. [Medline]. Shimizu S, Hoshi K, Muramoto T, Homma M, Ironside JW, Kuzuhara S, et al. Creutzfeldt-Jakob disease with florid-type plaques after cadaveric dura mater grafting. Arch Neurol. 1999 Mar. 56(3):357-62. [Medline]. Sellar RJ, Will RG, Zeidler M. MR imaging of new variant Creutzfeldt-Jakob disease: the Pulvinar sign. Neuroradiology. 1997. 39:S53. Zeidler M, Sellar RJ, Collie DA, Knight R, Stewart G, Macleod MA, et al. The pulvinar sign on magnetic resonance imaging in variant Creutzfeldt-Jakob disease. Lancet. 2000 Apr 22. 355(9213):1412-8. [Medline]. Collie DA, Summers DM, Sellar RJ, Ironside JW, Cooper S, Zeidler M, et al. Diagnosing variant Creutzfeldt-Jakob disease with the pulvinar sign: MR imaging findings in 86 neuropathologically confirmed cases. AJNR Am J Neuroradiol. 2003 Sep. 24(8):1560-9. [Medline]. Martindale J, Geschwind MD, De Armond S, et al. Sporadic Creutzfeldt-Jakob disease mimicking variant Creutzfeldt-Jakob disease. Archives of Neurology. 2003. 60:767-770. Finkenstaedt M, Szudra A, Zerr I, Poser S, Hise JH, Stoebner JM, et al. MR imaging of Creutzfeldt-Jakob disease. Radiology. 1996 Jun. 199(3):793-8. [Medline]. Urbach H, Klisch J, Wolf HK, Brechtelsbauer D, Gass S, Solymosi L. MRI in sporadic Creutzfeldt-Jakob disease: correlation with clinical and neuropathological data. Neuroradiology. 1998 Feb. 40(2):65-70. [Medline]. de Silva R, Patterson J, Hadley D, Russell A, Turner M, Zeidler M. Single photon emission computed tomography in the identification of new variant Creutzfeldt-Jakob disease: case reports. BMJ. 1998 Feb 21. 316(7131):593-4. [Medline]. Yamada M, Variant CJD Working Group, Creutzfeldt-Jakob Disease Surveillance Committee, Japan. The first Japanese case of variant Creutzfeldt-Jakob disease showing periodic electroencephalogram. Lancet. 2006 Mar 11. 367(9513):874. [Medline]. Caobelli F, Cobelli M, Pizzocaro C, et al. The Role of Neuroimaging in Evaluating Patients Affected by Creutzfeldt-Jakob Disease: A Systematic Review of the Literature. Journal of Neuroimaging. 2015. 25:2-13. Moda F et al. Prions in the urine of patient with variant Creutzfeldt-Jakob disease. New England Journal of Medicine. Aug 2014. 371 (6):530-539. Heinemann U et al. Brain biopsy in patients with suspected Creutzfeldt-Jakob disease. J Neurosurg. 2008. 109:735-741. Safar JG et al. Diagnosis of human prion disease. Proc Natl Acad Sci USA. 2005. 102:3501-3506. Manix et al. Creutzfeldt-Jakob disease: updated diagnostic criteria, treatment algorithm, and the utility of brain biopsy. Neurosurgical Focus. November 2015. 39:1-11. Centers for Disease Control and Prevention. Department of Health and Human Services. vCJD (Variant Creutzfeldt-Jakob Disease). Treatment. Available at http://www.cdc.gov/ncidod/dvrd/vcjd/treatment.htm. Accessed: 5/30/2012. Medline Plus. Creutzfeldt-Jakob Disease. Available at http://www.nlm.nih.gov/medlineplus/ency/article/000788.htm. Accessed: 5/30/2012. Genetic Prion Diseases. National Center for Biotechnology Information. US National Library of Medicine. Bethesda, Maryland. Available at http://www.ncbi.nlm.nih.gov/books/NBK1229/. Accessed: 5/30/2012. Trevitt CR, Collinge J. A systematic review of prion therapeutics in experimental models. Brain. 2006 Sep. 129(Pt 9):2241-65. [Medline]. Knight RSG. Potential Treatments for Creutzfeldt-Jakob Disease. The National Creutzfeldt-Jakob Disease Surveillance Unit. Available at http://www.cjd.ed.ac.uk/TREAT.htm. Accessed: February 25, 2005. Korth C, May BC, Cohen FE, Prusiner SB. Acridine and phenothiazine derivatives as pharmacotherapeutics for prion disease. Proc Natl Acad Sci U S A. 2001 Aug 14. 98(17):9836-41. [Medline]. [Full Text]. MRC Clinical Trials Unit. PRION-1: Randomised trial of quinacrine in human prion disease. Available at http://www.ctu.mrc.ac.uk/studies/cjd.asp. Accessed: July 6, 2005. PRION-1. Quinacrine for Human Prion Disease. Clinical Trials.gov. Available at http://clinicaltrials.gov/ct2/show/NCT00104663. Accessed: 5/30/2012. CJD (Creutzfeldt-Jakob Disease) Quinacrine Study. Clinical Trials.gov. Available at http://clinicaltrials.gov/ct2/show/NCT00183092. Accessed: 5/30/2012. Otto M, Cepek L, Ratzka P, Doehlinger S, Boekhoff I, Wiltfang J, et al. Efficacy of flupirtine on cognitive function in patients with CJD: A double-blind study. Neurology. 2004 Mar 9. 62(5):714-8. [Medline]. Wisniewski T, Sigurdsson EM, Aucouturier P. Conformation as a therapeutic target in the prionoses and other neurodegenerative conditions. In: Molecular and Cellular Pathology in Prion Disease. 2001. Sigurdsson EM, Brown DR, Daniels M, Kascsak RJ, Kascsak R, Carp R, et al. Immunization delays the onset of prion disease in mice. Am J Pathol. 2002 Jul. 161(1):13-7. [Medline]. Variant Creutzfeldt-Jakob Disease Current Data (March 2010). National CJD Surveillance Unit (NCJDSU). Available at http://www.cjd.ed.ac.uk/vcjdworld.htm. Accessed: May 24, 2010. Centers for Disease Control and Prevention. Questions and Answers Regarding Bovine Spongiform Encephalopathy (BSE) and Creutzfeldt-Jakob Disease (CJD). Centers for Disease Control and Prevention. Available at http://www.cdc.gov/. Aguzzi A, Glatzel M. vCJD tissue distribution and transmission by transfusion--a worst-case scenario coming true?. Lancet. 2004 Feb 7. 363(9407):411-2. [Medline]. Castilla J, Saa P, Soto C. Detection of prions in blood. Nat Med. 2005 Sep. 11(9):982-5. [Medline]. Guntz P, Walter C, Schosseler P, Morel P, Coste J, Cazenave JP. Feasibility study of a screening assay that identifies the abnormal prion protein PrP(TSE) in plasma: initial results with 20,000 samples. Transfusion. 2010 Jan 15. [Medline]. UK Department of Health. CJD. Available at http://www.dh.gov.uk/Home/fs/en. US Food and Drug Administration. Bovine Spongiform Encephalopathy (BSE). US-FDA. Available at http://www.fda.gov/. US Food and Drug Administration. Guidance for Industry - Revised Preventative Measures to Reduce the Possible Risk of Transmssion of Creuztfeldt-Jakob Disease (CJD) and variant Creuztfeldt-Jakob Disease (vCJD) by Blood and Blood Products. US-FDA. Available at http://www.fda.gov/cber/gdlns/cjdvcjd.pdf. Accessed: January, 2002. Glatzel M, Ott PM, Linder T, Gebbers JO, Gmür A, Wüst W. Human prion diseases: epidemiology and integrated risk assessment. Lancet Neurol. 2003 Dec. 2(12):757-63. [Medline]. Centers for Disease Control and Prevention. Update 2002: Bovine Spongiform Encephalopathy and Variant Creutzfeldt-Jakob Disease. Centers for Disease Control and Prevention; 2002. Available at http://www.cdc.gov/. Doh-ura K, Ishikawa K, Murakami-Kubo I, Sasaki K, Mohri S, Race R, et al. Treatment of transmissible spongiform encephalopathy by intraventricular drug infusion in animal models. J Virol. 2004 May. 78(10):4999-5006. [Medline]. [Full Text]. Hill AF, Butterworth RJ, Joiner S, Jackson G, Rossor MN, Thomas DJ, et al. Investigation of variant Creutzfeldt-Jakob disease and other human prion diseases with tonsil biopsy samples. Lancet. 1999 Jan 16. 353(9148):183-9. [Medline]. Isozumi K, Fukuuchi Y, Tanaka K, Nogawa S, Ishihara T, Sakuta R. A MELAS (mitochondrial myopathy, encephalopathy, lactic acidosis, and stroke-like episodes) mtDNA mutation that induces subacute dementia which mimicks Creutzfeldt-Jakob disease. Intern Med. 1994 Sep. 33(9):543-6. [Medline]. Office International des Epizooties. Bovine Spongiform Encephalopathy (BSE). Office International des Epizooties. Available at http://www.oie.int/eng/info/en_esb.htm. Accessed: December 24, 2004. UK Blood Transfusion Services. UK Blood Transfusion & Tissue Transplantation Guidelines. UK Blood Transfusion & Tissue Transplantation Services. Available at http://www.transfusionguidelines.org.uk. United States Department of Health and Human Services. Expanded "Mad Cow" Safeguards Announced To Strengthen Existing Firewalls Against BSE Transmission. Available at http://www.hhs.gov/news/press/2004pres/20040126.html. Accessed: January 26, 2004. Wisniewsky T. Prion-Related Diseases. Available at: http://emedicine.medscape.com/article/1168941-overview. Medscape Reference [serial online]. 2004:[Full Text]. Brown K, Mastrianni JA. The prion diseases. J Geriatr Psychiatry Neurol. 2010. 23 (4):277-298. Normal fluid-attenuated inversion recovery (FLAIR) image at the level of the basal ganglia shows that the thalamus is normally isointense or slightly hypointense relative to putamen. From Collie DA, Summers DM, Sellar RJ, et al. "Diagnosing variant Creutzfeldt-Jakob disease with the Pulvinar sign: MR imaging findings in 86 neuropathologically confirmed cases." Am J Neuroradiol, 2003;24: 1560-9. Pulvinar sign of variant Creutzfeldt-Jakob disease. Fluid-attenuated inversion recovery (FLAIR) image shows marked symmetrical hyperintensity of the pulvinar (posterior) thalamic nuclei, and this sign is present in 100% of cases imaged with FLAIR imaging. From Collie DA, Summers DM, Sellar RJ, et al. "Diagnosing variant Creutzfeldt-Jakob disease with the Pulvinar sign: MR imaging findings in 86 neuropathologically confirmed cases." Am J Neuroradiol, 2003;24: 1560-9. Axial fluid-attenuated inversion recovery (FLAIR) showing periaqueductal gray matter hyperintensity (arrow). Although not a specific sign, periaqueductal hyperintensity is observed in 83% of patients imaged with FLAIR imaging. From Collie DA, Summers DM, Sellar RJ, et al. "Diagnosing variant Creutzfeldt-Jakob disease with the Pulvinar sign: MR imaging findings in 86 neuropathologically confirmed cases." Am J Neuroradiol, 2003;24: 1560-9. Hockey stick sign of variant Creutzfeldt-Jakob disease. Fluid-attenuated inversion recovery (FLAIR) image shows symmetrical pulvinar and dorsomedial thalamic nuclear hyperintensity. This combination produces a characteristic hockey stick appearance and is present in 93% of patients imaged with FLAIR imaging. From Collie DA, Summers DM, Sellar RJ, et al. "Diagnosing variant Creutzfeldt-Jakob disease with the Pulvinar sign: MR imaging findings in 86 neuropathologically confirmed cases." Am J Neuroradiol, 2003;24: 1560-9. Prion protein (PrP) accumulation in the tonsil in variant Creutzfeldt-Jakob disease within follicular dendritic cells and macrophages in a germinal center as demonstrated by PrP immunocytochemistry. From Ironside JW, Frosch MP, Bernardino G. "Human prion diseases." In: Gray F, De Girolami U, Poirier J, eds. Escourelle & Poirier Manual of Basic Neuropathology. Philadelphia, Pa: Elsevier, 2004: 145-57. The florid plaque in the cerebral cortex in variant Creutzfeldt-Jakob disease comprises a dense core with a paler outer layer of amyloid fibrils surrounded by spongiform change (hematoxylin and eosin stain at low magnification). From Ironside JW, Frosch MP, Bernardino G. "Human prion diseases." In: Gray F, De Girolami U, Poirier J, eds. Escourelle & Poirier Manual of Basic Neuropathology. Philadelphia, Pa: Elsevier, 2004: 145-57. The florid plaque in the cerebral cortex in variant Creutzfeldt-Jakob disease comprises a dense core with a paler outer layer of amyloid fibrils surrounded by spongiform change (hematoxylin and eosin stain at high magnification). From Ironside JW, Frosch MP, Bernardino G. "Human prion diseases." In: Gray F, De Girolami U, Poirier J, eds. Escourelle & Poirier Manual of Basic Neuropathology. Philadelphia, Pa: Elsevier, 2004: 145-57. Immunocytochemistry for prion protein (PrP) shows strong staining of the florid plaques and multiple smaller plaques and diffuse PrP deposits (low magnification). From Ironside JW, Frosch MP, Bernardino G. "Human prion diseases." In: Gray F, De Girolami U, Poirier J, eds. Escourelle & Poirier Manual of Basic Neuropathology. Philadelphia, Pa: Elsevier, 2004: 145-57. Immunocytochemistry for prion protein (PrP) shows strong staining of the florid plaques and multiple smaller plaques and diffuse PrP deposits (higher magnification). From Ironside JW, Frosch MP, Bernardino G. "Human prion diseases." In: Gray F, De Girolami U, Poirier J, eds. Escourelle & Poirier Manual of Basic Neuropathology. Philadelphia, Pa: Elsevier, 2004: 145-57. Could Type 2 Diabetes Be a Prionlike Transmissible Disease?